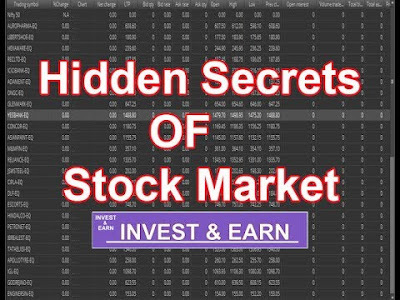 Money Market Tips: STOCK MARKET--What are the hidden secrets of the stock market? STOCK MARKET--What are the hidden secrets of the stock market? Buy at rumor and sell at news ! Data is everything! No wonder why they say, Information is wealth. No matter how smart you are, there are always a bunch of people who make hell lot of money based on Insider Information. Many intraday traders use to watch the news channel or sites like moneycontrol to keep scanning for some stocks news, so that traders can short list the stocks they want to trade on, get in and out for some quick profits. Basically they want to make use of the momentum the news has created for the stock. There is a typical observation or pattern that have witnessed recently. Most of the time the stock reacts before the news hits the market. There was a news that Alembic Pharma got a FDA approval. As per stock exchange rules, it is mandatory for every company to disclose such news to exchange, so it is the NSE/BSE exchange which gets such information first. Only then it gets shared with Media. We usually run bots to scan for such news in NSE site, as and when such alerts comes, its gets shared with all Telegram users. As you can see the alert was published at 10:51 in NSE site, but the stock reacted positively much before the news was made public. There are certain people who have access to such sensitive information would move the stock price much earlier. But poor retail traders seeing the positive news, try to buy at the day high price and gets trapped, as the other people who bought much early would liquidate their position and make profit. Its a typical example of Buy at rumor and sell at news, its better to react opposite in such situation and people who shorted at this level seeing the good news would have made money.